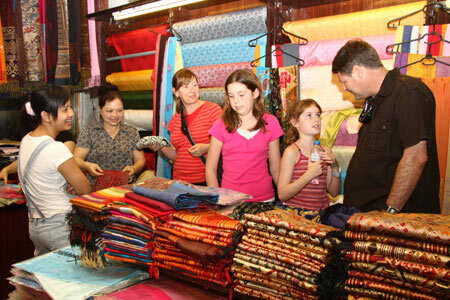 Silk, called lụa in Vietnamese, was considered an extravagant luxury in feudal times, associated with wealth and success. It was only worn by Kings, Queens, and mandarins. Vietnam’s various dynasties developed strict rules regimenting the colour, ornamentation, style, and fabric of clothes worn by aristocrats. The decorative patterns of Van Phuc silk are used as models by Vietnamese craftsmen and artisans when applying images to other thin and fibrous materials. Weavers here draw, spin, glue, and knit cords into silk, brocade, satin, chiffon, bằng, quế, sa, and đũi (traditional types of cloth). They feature sophisticated patterns of birds, animals, flowers and leaves—even the famous 20m long “two dragons kowtowing the moon”.